Ranked 175 out of 188 countries within UNDP’s Human Development Index, Mali is a land-locked country in the Sahel where half the population lives on less than $1.90 a day. The country is challenged by natural disasters, a quickly growing population with a median age of 16, and persistent insecurity sparking continued displacement throughout the north and center of the country. Having worked in the country since 1999, CRS serves the poor and vulnerable through coordinating complex and multi-sectoral emergency and development programs across nearly all regions (visit our programming map). Placing partnership at the core of its work, the country program works jointly with 18 partners including government ministries and national and international NGOs. Visit these links to read more about CRS’ presence in Mali and our programming in agricultural livelihoods, emergency response & recovery, health, education, and resilience. Students at Diarrabougou School in Mali will receive a free school lunch each day through Catholic Relief Services' Jigiya program, also known as Food for Education. CRS’ agricultural programming supports smallholder farmers organize themselves into highly functional farmer cooperatives, adopt diversified production strategies and improve their livelihoods and nutritional status while collaborating with national and international research institutes to broadly distribute agriculture innovations. CRS’ agricultural programming serves as a driving force connecting research, local government extension agents, and farmer associations. CRS collaborates with national and international research institutes to broadly disseminate innovations to farmer associations by working directly with local branches of the Government of Mali’s technical services. With this approach, CRS introduces farmers to new technologies, crop varieties and techniques that are adapted to their agroecological conditions while strengthening government structures from the ground up. Through its role in four USAID Feed the Future projects, a World Bank-funded initiative and livelihood pilot projects, CRS has reached over 43,000 farmers and producers. CRS emergency programming ranges from rapid life-saving responses to longer-term recovery efforts addressing both conflict and natural disasters. Mali continues to face compounded crises with the escalation of conflict-induced displacement in the insecure center and north as well as seasonal flooding and persistent drought. CRS leverages its broad expertise to quickly and safely address the unique needs of vulnerable populations, including internally displaced people, repatriates, pastoralists, malnourished children and pregnant women. CRS’ emergency rapid response mechanism, funded by USAID/OFDA, conducts needs assessments immediately following disasters and shares information with humanitarian actors via the Kisili Project Website to prompt coordinated, lifesaving responses. In 2016, the emergency team worked in partnership with local NGOs and government entities to conduct 10 rapid assessments and deliver aid to 25,030 people in crisis. The efficiency of all CRS Mali projects, and emergency programming in particular, is aided by the agency’s expertise in Information Communication and Technology for Development (ICT4D). CRS supports multi-level health systems strengthening to promote and sustain universal access to health services. Working with local partners and directly with the Mali Ministry of Health, we strengthen the capacity of local healthcare professionals to prevent and react to diseases that ravage the region, including tuberculosis, malaria and epidemic-prone diseases. As the principal recipient of the Global Fund tuberculosis grant in Mali since 2012, CRS supports the PNLT in delivering their mandate by training more than 1,400 health workers and over 240 rural doctors on TB treatment strategies and equipping health centers with essential diagnostic materials, including LED microscopes, GenXpert machines, chest X-ray equipment and diagnostic reagents. CRS is also working with the national health system and the PNLP to administer seasonal malaria chemoprevention to over 1.7 million children with funding from the Global Fund malaria grant. CRS also leads Global Health Security Agenda programming funded by the Centers for Disease Control, which in close collaboration with the Ministry of Health strengthens the health system’s ability to prevent, detect, and respond to infectious disease outbreaks, prevent cross-border epidemics and mitigate public health epidemics of international concern. The Food for Education Program is CRS Mali’s largest and longest-running program since 2007. Originally conceived of as a school meals program designed to increase girls’ and boys’ primary school enrollment and attendance rates, it has broadened to include quality instruction, and is on its third phase thanks to continued support from the United States Department of Agriculture McGovern-Dole program. The program’s expanded scope addresses key needs within Mali’s broader education context through teacher capacity building, student enrollment campaigns and attendance prizes, school feeding and the distribution of take-home rations, the provision of vitamin A and deworming medication, and the development of school gardens. Learn more by watching the CRS Mali video in English or in French. 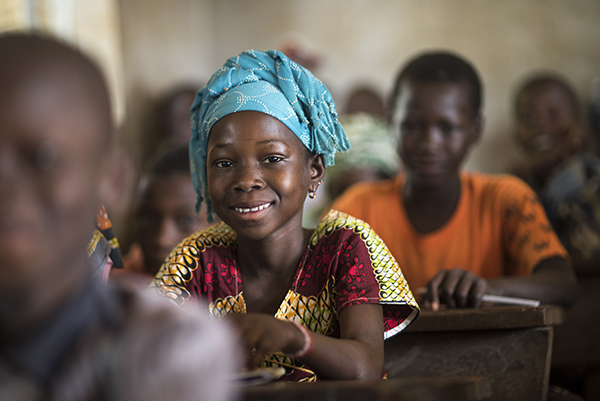 Insecurity negatively affects Mali’s education system, causing school closures and jeopardizing thousands of school-aged children’s access to education. In response to this situation, CRS plans to broaden its portfolio to include emergency education programming. Bridging humanitarian and development efforts, CRS also supports families and communities to reduce their vulnerability to short-term shocks while empowering local structures to address the key root causes of fragility with concrete skills to recover from disasters and reduce their impact in the longer term. In northern Mali, CRS leads resilience efforts through the UKAid-funded Braced Project and the European Union-funded Lafia Proresa to help communities affected by insecurity to adapt to climate extremes while strengthening social safety nets and food security. As Mali’s poorest communities are disproportionately affected by chronic flooding, CRS has also strengthened local disaster risk reduction capacity in urban centers to promote early warning systems, proper waste management, and safer construction practices. Since 1999, CRS Mali has run development programs that build resilience in rural areas. After rebel incursions in northern Mali in late 2011, CRS began serving displaced persons with emergency assistance. In March 2012, a coup and rebel occupation caused massive population displacement toward the south. This was preceded by drought in 2011, and followed by large-scale flooding in 2012. In 2013, the Malian government, with Economic Community of West African States, United Nations and donor support, retook the north, though sporadic attacks continue. The reopening of the north and democratic presidential elections in August 2013 ushered in new possibilities for disaster recovery, rebuilding, and development. The CRS Mali Headquarters is located in the capital city of Bamako. Sub-offices in Mopti, Gao, and Timbuktu support the agency in quickly serving communities where the greatest needs exist. The Timbuktu Office opened in October 2016 to address the needs of returned refugees, internally displaced people and host families in a region suffering from malnutrition, severe drought, and the presence of armed groups.